Back when Ms. Mannequin started, they were all about contemporary fashion. Not really runway fashion (though if you want that Boots of Pop Culture and Paper Dolls is doing a great catwalk series right now, just sayin…), but the latest thing from the boutiques. In essence, I wanted to draw trendy stuff right from the fashion magazines. So, one of the things I drew a few weeks ago were some pages of trendy clothing for the Ms. Mannequin girls. Today, they have a pair of cropped “paper bag pants” and I have to say, that is a really dumb name. However, these pants are very much in vogue at the moment. To go with them, I drew a wrapped crop top and then I added an scalloped edged pencil skirt, because I like to draw at least three pieces when I do contemporary paper doll clothing. These pieces can mix and match with any of the Ms. Mannequin clothing you already have printed out. So, when you are about to get the paper dolls ready for summer, they now have some on tread cropped “paper bag” pants. Want to see things from the archives without having to go through the archives yourself? 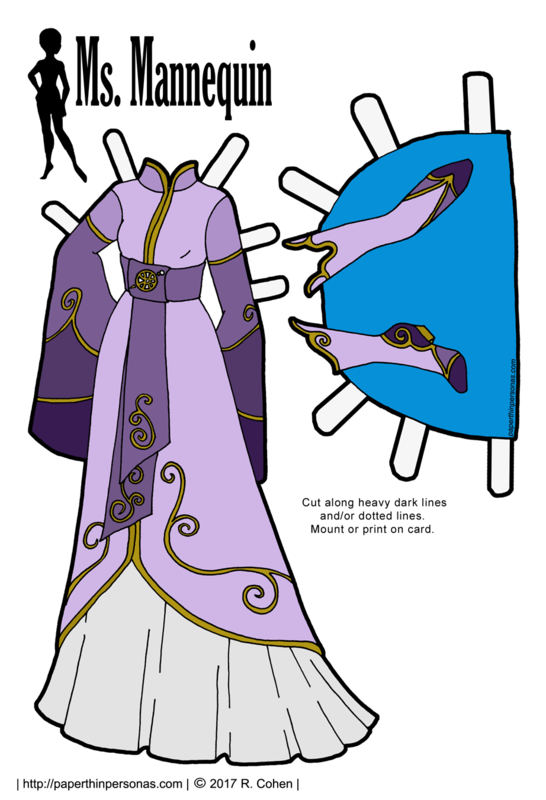 Follow the facebook page where I post paper dolls from PTP’s archives regularly. More interested in what happens behind the scenes, my process, seeing sketchbook pages, and helping cover my server costs? Then join Patreon. I only have one book on 1960s fashion. To give a comparison, I have three on 1920s fashion. So, if anyone has a rec, leave it in the comments. I really should track down more, since I do enjoy the era. 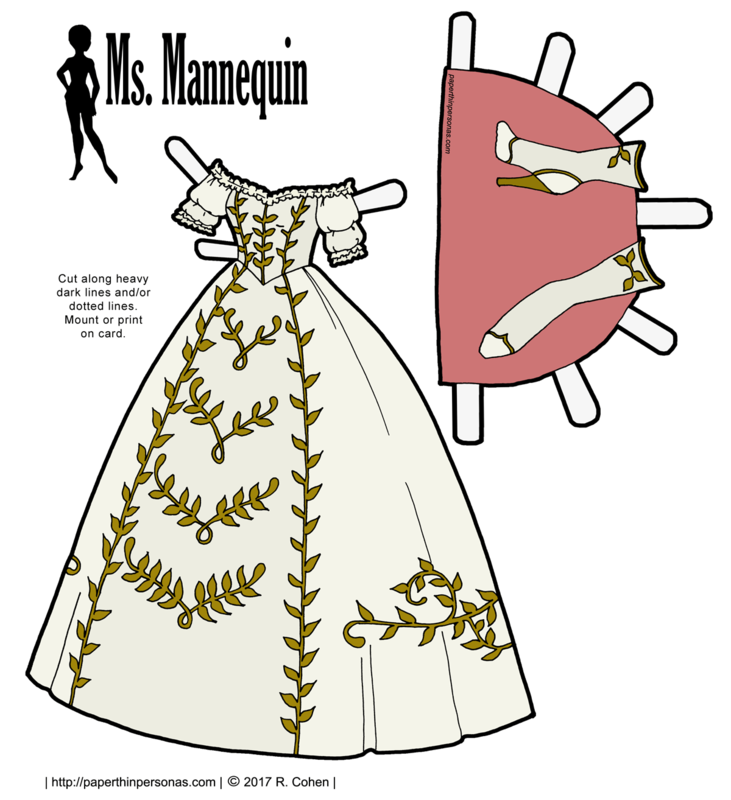 Today’s Ms. Mannequin outfit comes from this fashion design by Creators Studio. The original dress was a blue and blue windowpane plaid, but plaid is my nemesis, so I omitted it. Want to help keep the blog running and see super fun behind the scenes content? Then join the Patreon group. Plus, there also the Facebook page where I am sharing stuff from the archives and the erratic sketchbook page. Meanwhile, there’s a 25% off coupon for my readers (Reader2017) good in my Etsy store until the end of the month. Nothing terribly 1960s in there, yet, but I have done some smashing evening gowns. Today’s Printable Paper Doll Inspirations: Elves! ELVES! When I decided to draw my elven Ms. Mannequin doll, (name), I knew I needed to also draw some elven clothing for her. For that, I turned to my favorite costuming site The Costumer’s Guide to Movie Costumes. It’s not the most updated or the flashiest, but it has a lot of photos and often photos of people who aren’t the “main character” which is handy. Since my patrons specifically asked for LoTR inspired fantasy stuff, I wanted to honor that request. In the movies, the elves seem to have a lot of stand collars and long sleeves. Based on those trends, I designed this gown. It is probably actually two gowns. A robe like garment over an under-gown. I imagine the robe is in something thick and soft like velvet and the under-gown is a raw silk. 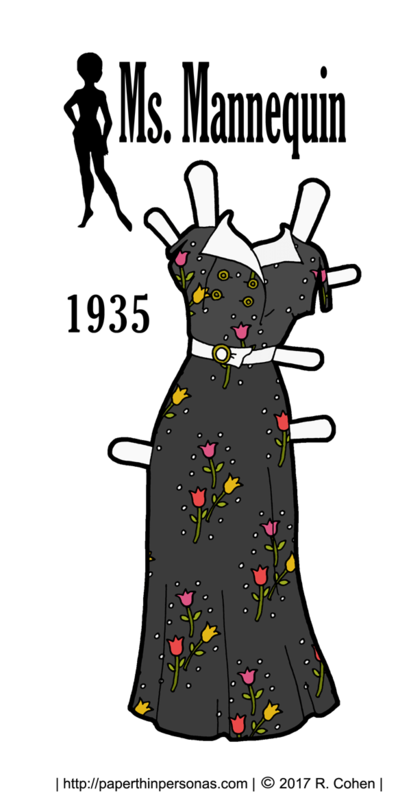 Coloring today’s paper doll gown turned out to be very fun. I actually developed three different color schemes for it, before I settled on this monochromatic scheme. But I didn’t want my other two scheme to not get any time to shine, so there’s an autumn color scheme that you can see over on the Patreon page. (Plus, you can join while your there, if you’d like). Meanwhile, on the blog’s Facebook page, there is a winter storm color scheme. Hop to the Patreon post and the Facebook page and then tell me, which of these schemes is your favorite in a comment? I’m curious to know. Meanwhile, there’s a coupon for my readers (Reader2017) good in my Etsy store until the end of the month. It’s 25% off. 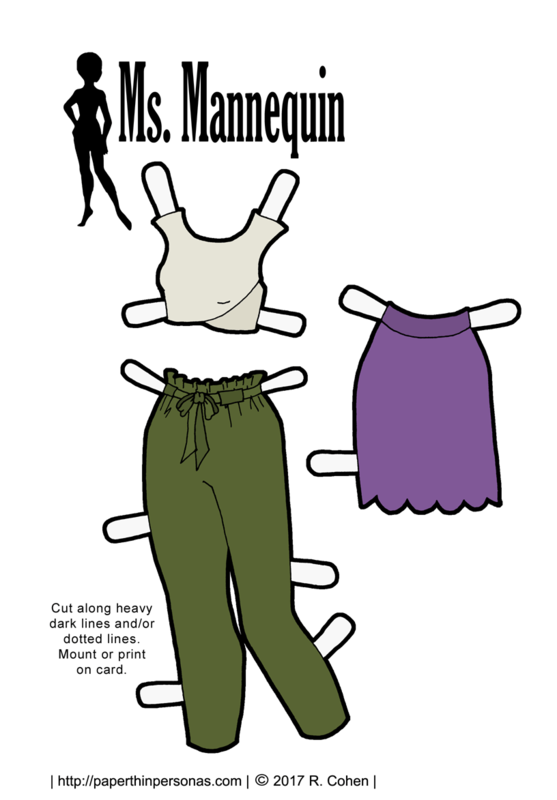 Today’s post is a chance to go back to where the the Ms. Mannequin printable paper doll series began and once again embrace the original idea. Wide legged trousers, cold shoulder tops and a brocade skirt are all taken straight from my fashion magazine collection. 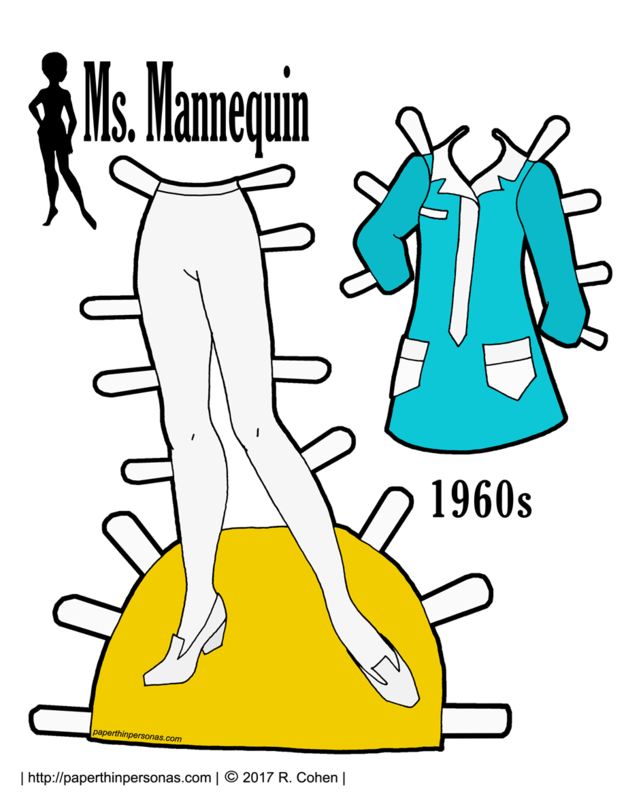 When I first started the Ms. Mannequin paper dolls, the idea as that they were models. Their pose and body build were both intended to evoke the idea of a contemporary fashion model. In fact, when I first posted them, I didn’t really intend for them to become a series. I figured I would post a few pages for them and move on. But, as it turned out, the response to Ms. Mannequin paper dolls was very positive. Plus, I found I enjoyed drawing contemporary fashion for them. Over time, that contemporary fashion has expanded into fantasy, history, cyberpunk and steampunk paper doll clothing. I must confess I am curious through, what do you like more? Contemporary clothing or other stuff for the Ms. Mannequins? Let me know in a comment. And, as always, if you love the blog, think about becoming a patron or liking the blog’s facebook page, or both. Last year, I decided I would draw some paper dolls based on older sets I have as a way to revisiting older work. So, today’s Ms. Mannequin outfit was inspired by this cyberpunk paper doll clothing set called “On Future Streets” that I created in 2014. The amount of cyberpunk stuff I draw for the paper dolls is directly proportional to the amount of Shadowrun I am playing at any given time. So, given that my usual group has gathered once more to play, I suspect 2017 will have more in the cyperpunk paper doll clothing genre. It helps me get ideas when I don’t have any ideas. A totally blank piece of paper is both the most inspiring and the most scary thing in the world. It helps me write about the post when I have to write the post. 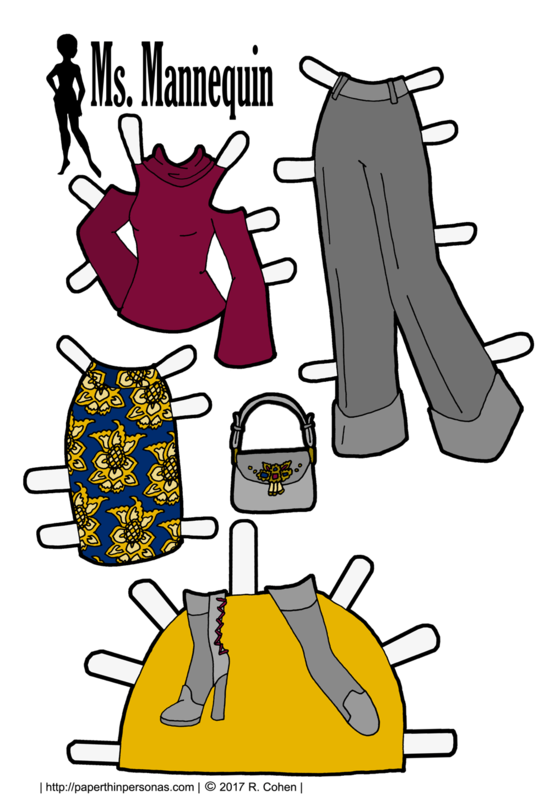 Because writing about these paper doll outfits is sometimes the hardest thing. So, I have the following things to say about this paper doll outfit today. I did wanted to make something that could be cyberpunk, but could also just be scifi. I totally can imagine someone from 5th Element wearing this get up. Actually, all the costumes in the 5th Element are amazing. I love that movie. Making things look shiny is a skill I was really out of practice at. I used to be so good at it. I shall have to practice more. Shiny things here I come! Writing blog posts as numbered lists is actually kinda fun. I should do this more often. As always, if you love PTP and want to donate to keep it up on the internets, please consider becoming a Patron. If you just want to know what I’m up too then you can follow it on Twitter. And if you want to make me feel less alone on the internet, leave a comment. 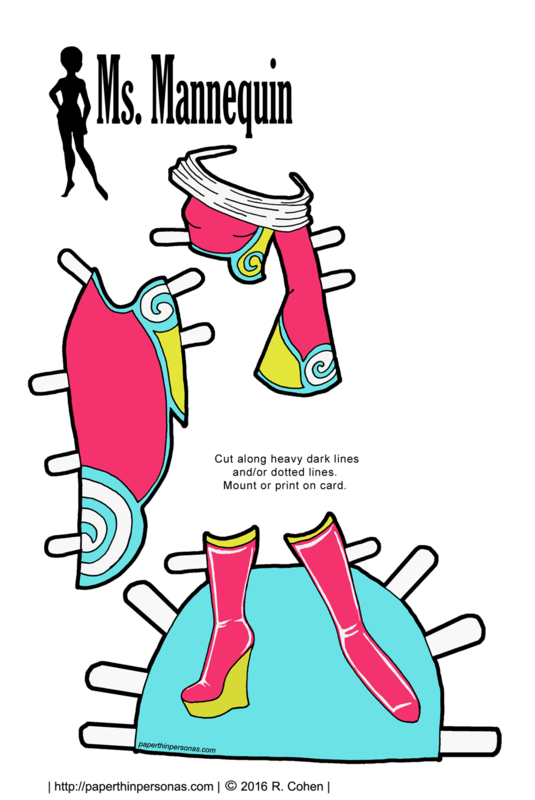 Tell me- Are you excited about more cyberpunk paper doll clothing?